Education evangelists Sumantra Roy and Rubia Braun are the Bangalore-based co-founders of Learning Yogi Pte. Ltd (estb.2014), a social impact edtech start-up offering a comprehensive digital game designed to teach reading, maths, science, creativity, critical thinking and problem solving skills to children in the four-seven years age group. Roy is currently the company’s CEO, and Braun its creative director. 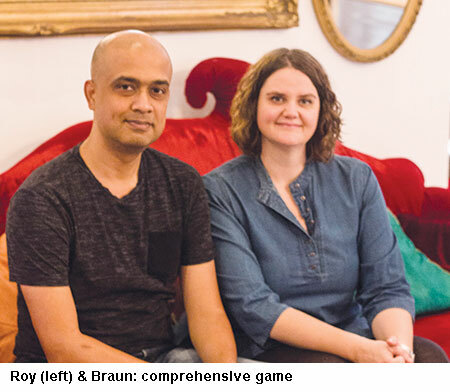 Learning Yogi’s flagship digital gaming app christened Atlas Mission combines artificial intelligence, teaching and parenting with the magic of storytelling. It can be downloaded from Google and Apple stores on to any tablet or smartphone device. Thus far, Atlas Mission has been downloaded in 75 countries, including India. Newspeg. To celebrate its fourth anniversary last December, the company introduced a unique creative arts games module in Atlas Mission. History. An economics and business management alumnus of Presidency University, Kolkata and the blue-chip Indian School of Business, Hyderabad, Roy is a serial entrepreneur with 19 years of experience in technology, education and marketing who co-promoted two digital marketing companies (2000-2014) prior to founding Learning Yogi with his Australia-born wife Rubia Braun, whom he met at a yoga class in Bangalore. A media studies and early childhood education graduate of RMIT (Royal Melbourne Institute of Technology), Braun was the promoter-director of Metro Brava, Bangalore, a media and communications company which she exited in 2014. Direct talk. “Education systems around the world are doing a poor job of teaching children the skills they need to succeed in the newly emergent digital world. Therefore, Learning Yogi is driven by the mission to reinvent education suitable for the 21st century. Atlas Mission focuses on teaching children new- age skills such as creativity, critical thinking and problem solving in addition to core curriculum subjects like reading, maths and science. We also help children to develop appreciation of cultural diversity, as working with people from cross-cultural backgrounds is becoming critical in the rapidly inter-connected world. Our objective is not merely to gamify education, but to turn education into an enjoyable experience,” says Roy. Business model. Learning Yogi’s business model is subscriptions-based. Under its buy-1-gift-2 model, against each subscription payment, the Learning Yogi Foundation (estb. 2016) installs a free-of-charge Atlas Mission app in two low-cost Android tablets gifted to children from underprivileged households. Future plans. This creative duo has drawn up ambitious plans to scale Learning Yogi’s mission. “Encouraged by the response to our initial product designed for children in the age group four-seven years, we are in the process of developing apps for pre-primary and older children in the 8-16 age group. Simultaneously, the foundation is testing pilots with some low-income communities in Bangalore by partnering with NGOs and corporates looking to discharge their corporate social responsibility,” says Braun.